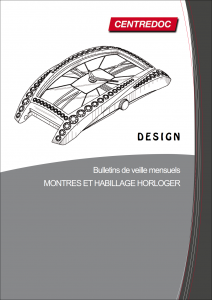 Every month, Design monitoring reports the new designs and models registered in the field of watchmaking. Issued in the form of PDF bulletins, this monitoring covers 14 countries. In most industrial sectors, design is tending to occupy an increasingly important role as a differentiating factor. In this context, companies, to protect themselves from counterfeiting, increasingly employ design and model registrations, which are intellectual property rights just like patents. Therefore, in order to achieve the twofold objective consisting in monitoring what the competitors are protecting and preventing infractions, the company must set up a design monitoring strategy. Monthly bulletin in PDF format of approximately 400 pages, with publications statistics by office, list of all entries and references complete with images. Search in PDF files with the usual tools. Electronic access to PDF bulletins.